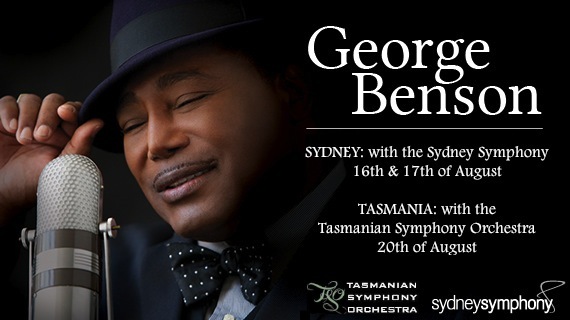 I am extremely honoured to return to the stage with the legendary George Benson, backing him in Sydney with the Sydney Symphony at the Sydney Opera House and in Tasmania, with the Tasmanian Symphony Orchestra at the Wrest Point Entertainment Centre. When multi-Grammy Award winner George Benson joins with the Sydney Symphony to pay tribute to Nat King Cole, you know the night will be Unforgettable. Description: Celebrating the swing and charm of the legendary Nat King Cole as well as his own chart-topping hits, George Benson will be performing songs from his upcoming album Inspiration, a tribute to Nat King Cole -including Smile, Unforgettable, Walkin' My Baby Back Home and Nature Boy. SSJ is more than just a band, it's a musical outfit - a collaboration with some of the finest musicians on the Sydney scene. Between them they have a mass of credits spanning theatre, television, opera, touring concerts and more. Working with the likes of John Farnham, George Benson, Guy Sebastian, Josh Groban, Delta Goodrem, Stan Walker, Jess Mauboy, Ronan Keating, Natalie Bassingthwaighte, Timomatic, Paulini and many more. A night of brilliant music, SSJ will be closing the show, farewelling Adam Katz as he heads off on his UK musical adventure, on the back of his newly released single 'Stars'.